The Paris Museum Pass gives you free access to over forty museums and monuments in Paris and the surrounding region. 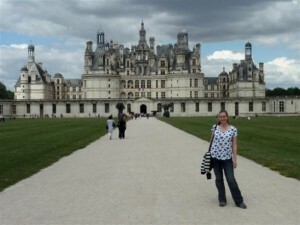 We decided to purchase a four day pass, thinking that with our planned visits to the Chateau de Versailles, the Louvre, the Towers of Notre Dame and the Arc de Triomphe, we would eventually come out ahead after paying the 56 Euros per pass. 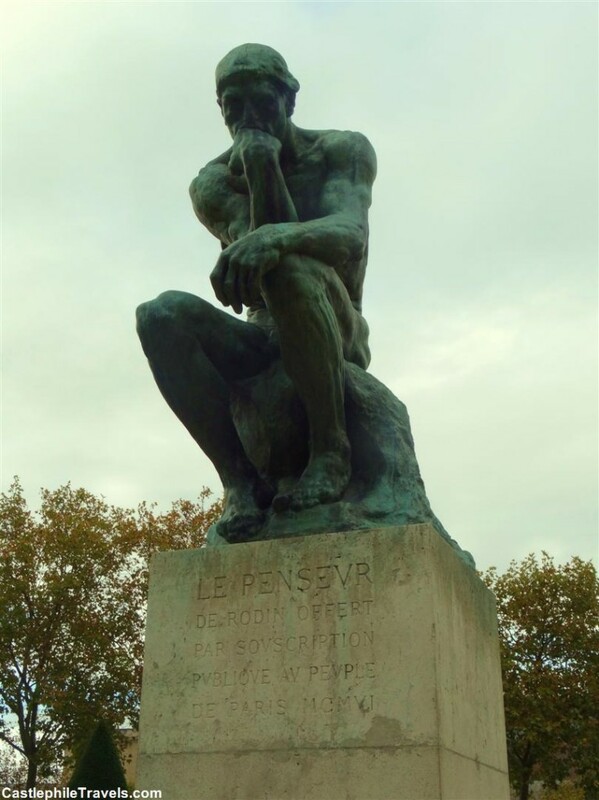 On my first orientation tour of Paris in 2010, my tour guide pointed out the back of Rodin’s The Thinker as the bus sped past. 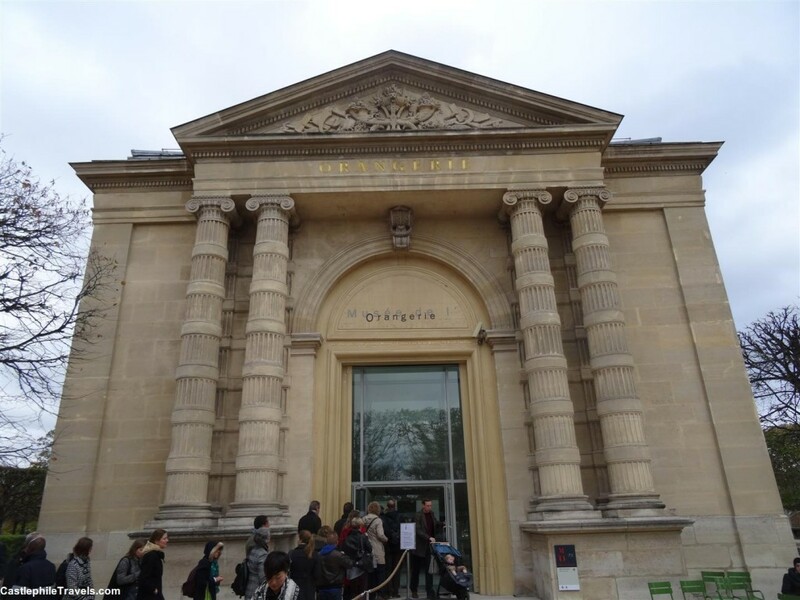 Ever since then, I’ve wanted to visit the Rodin museum – and since it was listed on the museums and monuments that were part of the Paris Museum Pass, I grabbed the opportunity. 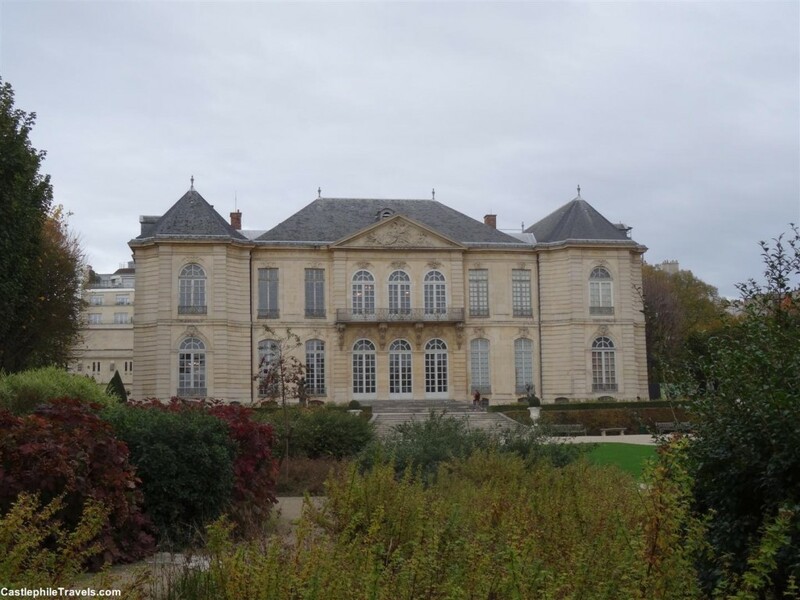 While darting from statue to sculpture in the gardens of the Musée Rodin, and deciding that the estate could be added to the shortlist of houses that I could live in, we began to worry – we couldn’t see The Thinker anywhere. It turned out we had taken the longest way around possible. As we had gone through the entrance and stood facing the chateau, we had headed left all the way around the gardens and then through the house. The Thinker was just to our right! For a break from the traditional sightseeing (and to get more value out of our Paris Museum Passes! 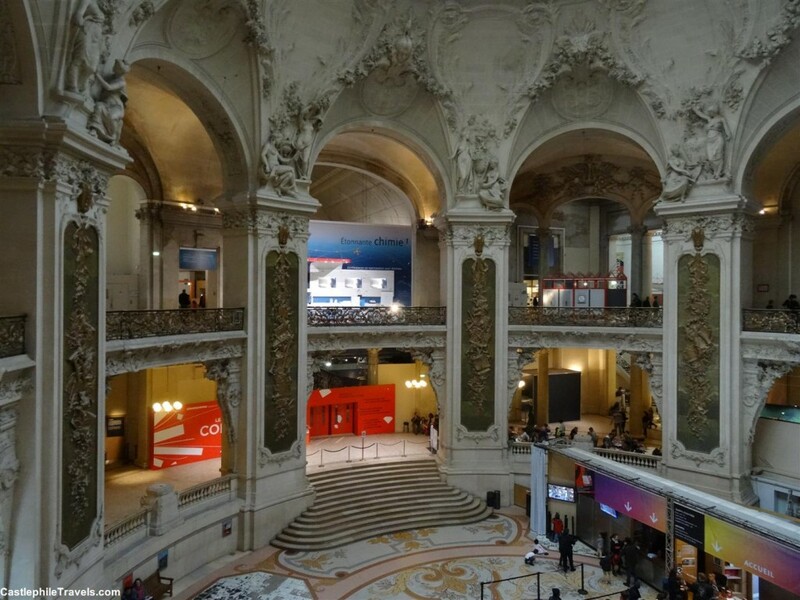 ), we headed for the Palais de la Découverte, a science and discovery museum housed in the Grand Palais. We were hoping for a French version of the Investigator Science Centre that we grew up with back in Adelaide. While there were some interactive games and exhibits (including some computer quizzes in English), there was a lot of reading to do as well and it wasn’t as hands-on as we were expecting. Note: Entrance to the Planetarium (3 Euros) was not included in the Paris Museum Pass. 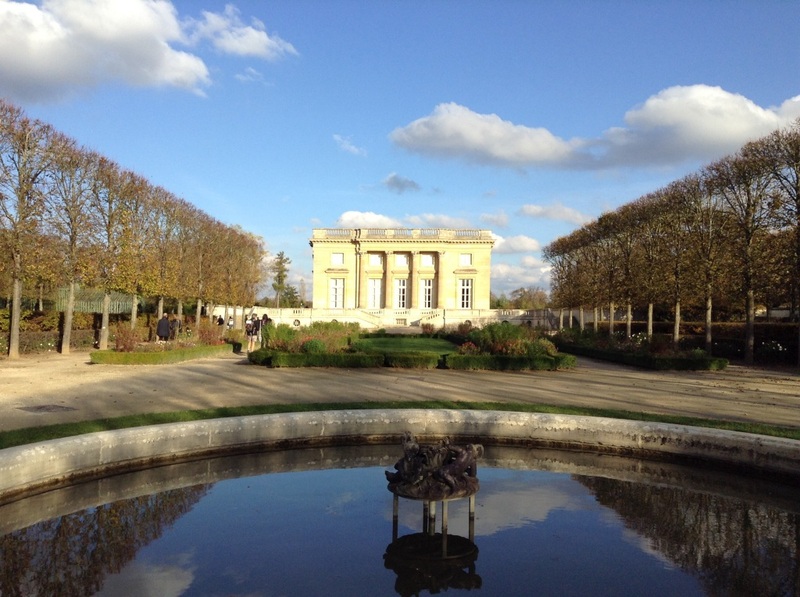 Another museum that was on my list to see was The Orangerie. I had wanted to go there to see Monet’s waterlilies paintings, but was surprised to find that they were not my favourite art pieces in the small gallery. I far preferred the Renoir portraits tucked away amongst the work of other renowned artists. The four day Paris Museum Pass was worth it for us, though admittedly some of the places we visited, such as the Palais de la Découverte, we only went to because it was listed on the Paris Museum Pass. We didn’t feel any pressure to visit as many sights as we could to make our money back. There were many other museums and monuments we could have crammed in if we had really wanted to, but we took it easy and still managed to come out ahead of what we would have paid visiting all of the sights separately. Since we visited Paris in autumn, we had no chance to be able to ‘jump the queue’ with our Paris Museum Passes, but having this ability would be very useful during June, July and August, when tourist numbers in Paris are at their peak. To find out whether it is worth it for you, take a look of the list of museums, palaces and attractions that the Paris Museum Pass grants you entrance to, and work out which ones you want to visit and whether you have the time to see them. 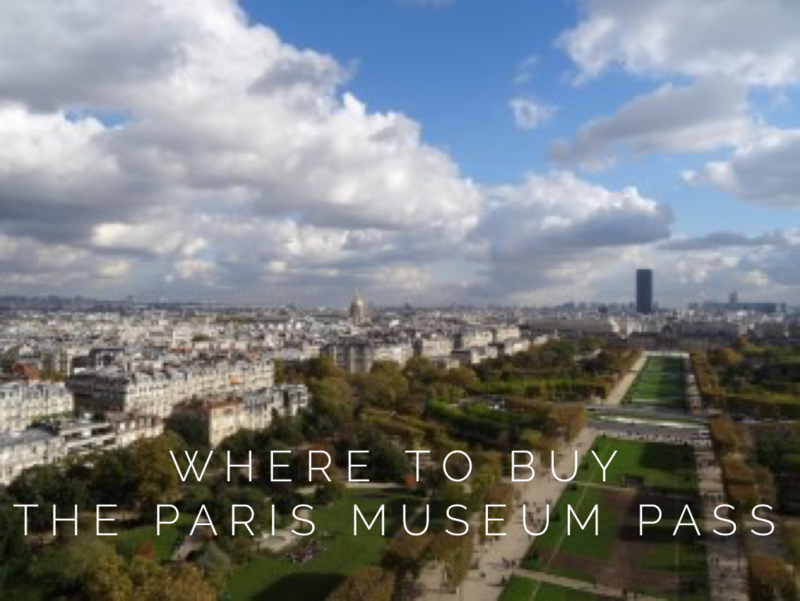 A complete list of the museums and monuments can be found on the Paris Museum Pass official website. After a lazy morning exploring Montmartre, we headed for the Arc de Triomphe for a 360 degree view of Paris and one of its busiest roundabouts. I enjoyed looking out along the straight avenues that lead to the Place de l’Étoile and watching the chaos on the road below as cars tried to navigate their way on to and off of the roundabout. We ended up spending the rest of the day window shopping along the Avenue des Champs-Élysées, before making our way up past the Palais Garnier to end the afternoon at the Galeries Lafayette. It was nice to have a day where we didn’t feel like we had to rush around to get our money’s worth out of our museum passes, and by the end of the day we had broken even. Anything we visited on Day 4 would essentially be ‘free’. 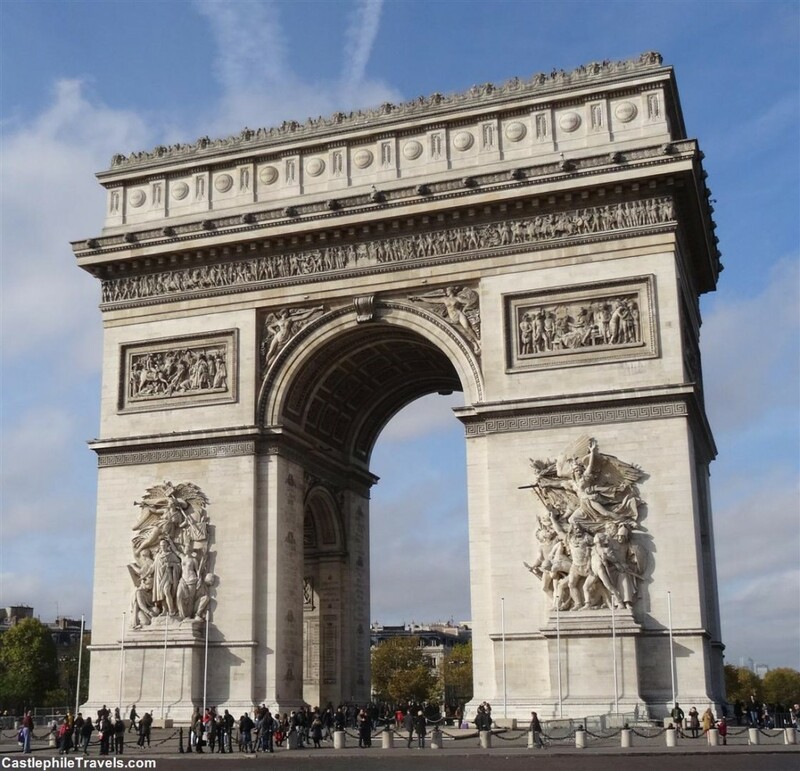 Want more information on the Arc de Triomphe? The grey Parisian sky was threatening rain, so we decided that the second day of our Paris Museum Pass challenge should be spent indoors as much as possible. We singled out a number of museums that people had recommended to us, such as the Musée National du Moyen Âge, as well as the iconic sights of the Louvre and Notre Dame. Armed with our Paris Museum Passes, we headed for the first stop on the list. 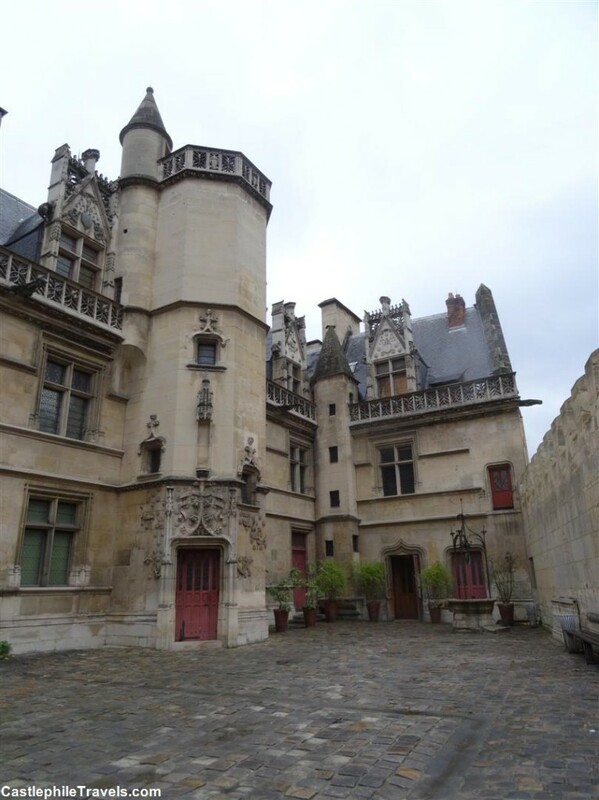 The Musée National du Moyen Âge is a museum housed in the Hôtel de Cluny. 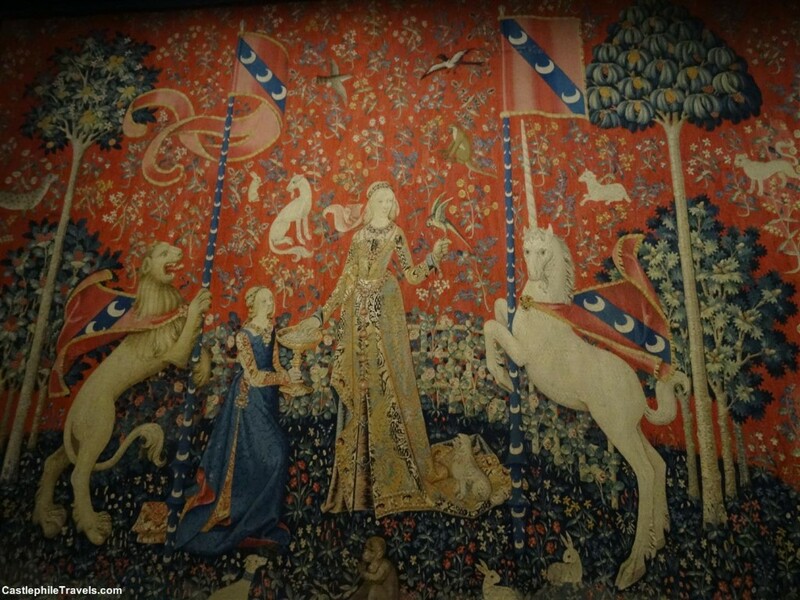 The museum is known for its collection of the six The Lady and The Unicorn tapestries, which I had wanted to see ever since reading Tracy Chevalier’s novel of the same name. The Musée National du Moyen Âge also contains a collection of artefacts from the Middle Ages, from illuminated books, stained glass, ancient statues and sculptures, decorative boxes, to religious objects and artwork, as well as having third century Gallo-Roman baths. Want more information on the Musée National du Moyen Âge? After visiting Notre Dame de Paris and admiring the beautiful stained glass rose windows, we joined the queue for the Towers climb. This was definitely easier to do in the off-season. We only had a wait of thirty minutes queueing along the side of the cathedral – much better than the two hour waits I’ve endured to climb the Towers during July and August. 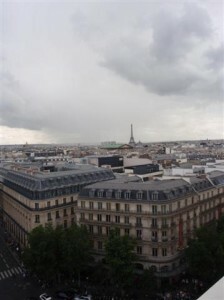 By the time we climbed up to the top of the South Tower, the sky had cleared, giving us beautiful views over Paris. Want more information on the Towers of Notre Dame? Maybe I’ve read too many ghost stories, but whenever I hear the word ‘crypt’, I think of dark chambers full of tombs and decaying bodies. 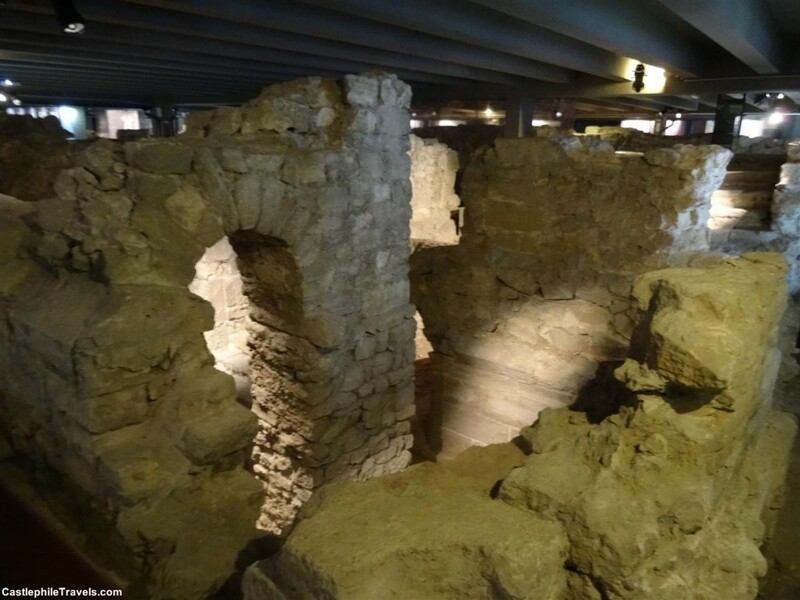 However, the Archaeological Crypt of Notre Dame, which is accessible from the courtyard in front of the cathedral, displays ruins of Roman foundations from when Paris was known as Lutetia. I’m not sure if I would have visited it if it hadn’t been part of the Paris Museum Pass, but that’s one of the good things about the pass – it allows you the freedom to check out a museum you might not otherwise have gone into, since it doesn’t cost you anything more. Want more information on the Archaeological Crypt of Notre Dame? 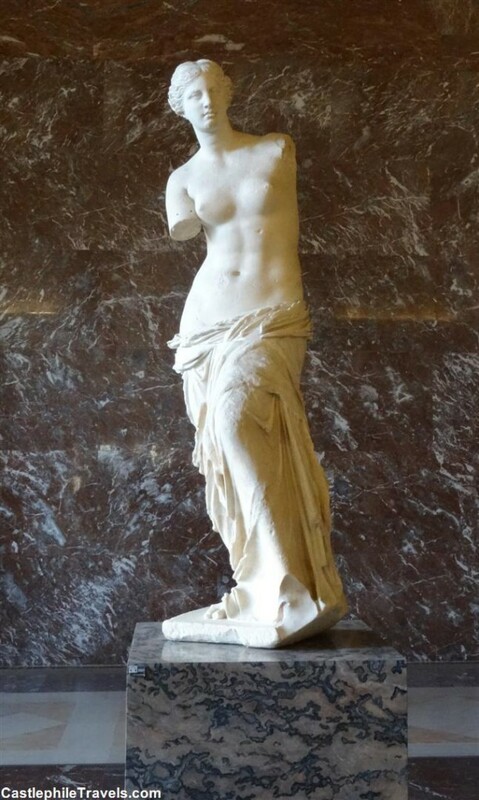 How is it that on my fourth visit to the Louvre I still end up getting lost and it is my brother who, on his very first visit, figures out how to get us to the Venus de Milo and the Mona Lisa? I will never understand why the Louvre makes me feel so disoriented. Want more information on the Musée du Louvre? The first challenge we faced was where to buy the pass. The stall by Notre Dame where I had bought them before was closed, so we wandered over to the Louvre, having read on the Paris Museum Pass website that they could be bought at the attraction’s ticket desks or online. At the Louvre, we were directed to an information office halfway between the inverted pyramid and the information desk at the Louvre. They sold passes as well as memberships to the Louvre, and were very helpful. Armed with our Museum Passes, we caught the metro to Gare Montparnasse and then hopped on a suburban train to Versailles-Chantiers. It took about fifteen minutes to get there, and the way from the Versailles-Chantiers train station to the Chateau de Versailles is well signed. The displays at Versailles had been updated since I was last there four years ago. There were audio visual presentations about how the chateau had been extended over the years, which seemed to be new. 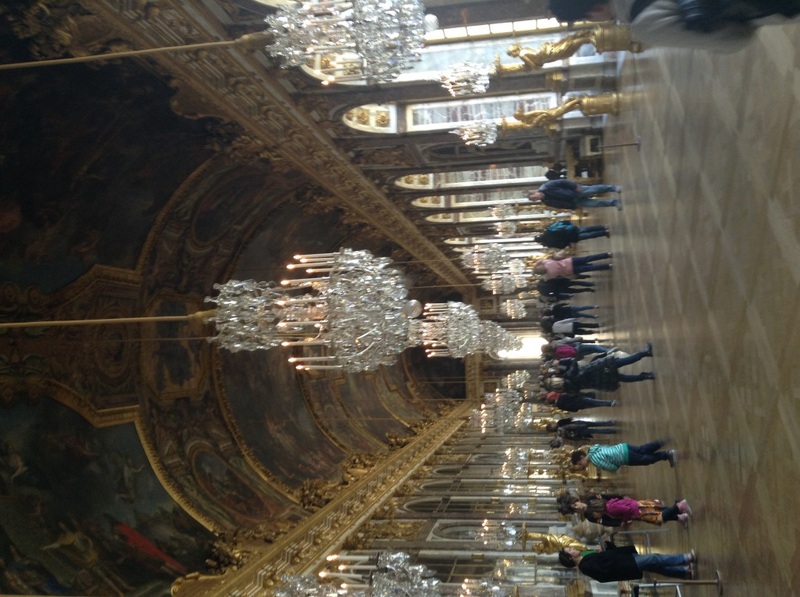 Versailles is one extravagant room after another, culminating in the Hall of Mirrors. On this visit, we also went in to the Mesdames Apartments, which with their white walls and ceilings, were a good antidote to the wall-to-ceiling paintings of the state apartments (I especially liked Madame Adelaide’s library nook). It was a beautiful day for strolling around the gardens. Blue skies and bright sunshine made me forget it was only 12 degrees! As we walked through the gardens from the chateau to the Trianons, we had fun getting lost in the maze of terraced gardens. Unfortunately, because we were there in November, the statues all had protective covers over them in preparation for winter, and construction and restoration works were taking place on many of the fountains, so the walk through the gardens and along the Grand Canal lost some of its idyll. I could happily make the Petit Trianon and its grounds my home. The rooms inside are cosy and not too grand. (The theatre was closed while we were there). 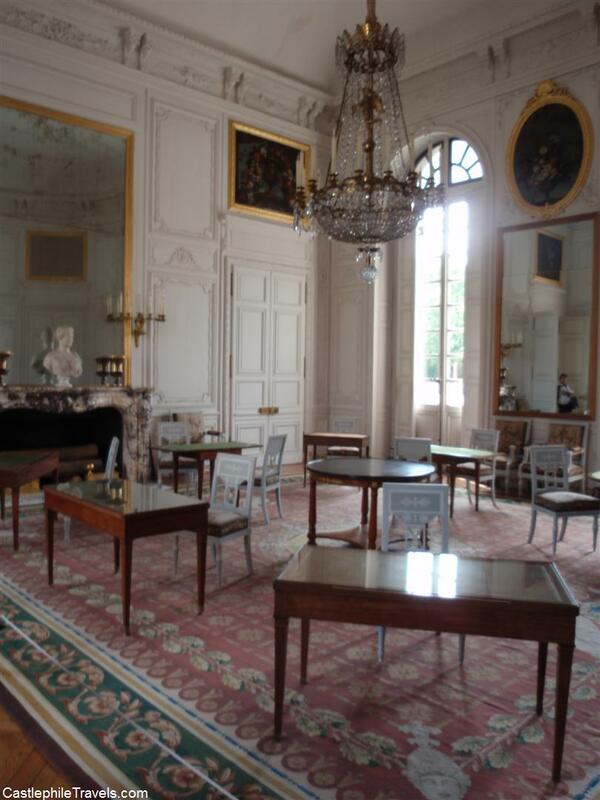 The Petit Trianon – I could see myself living here! This visit I had more time to wander around the hamlet and look at the buildings. My brother asked me what the purpose of it all was. When I told him it was Marie Antoinette’s place to escape and pretend she was someone else, he thought it was made for her when she was a little girl. I corrected him, and when I asked him if he could imagine me at the same age having a place like this, he admitted that he could! It was 4:30pm by the time we reached the Grand Trianon. The sun was already beginning to set, but the lights hadn’t been turned on in any of the rooms, making them dark. 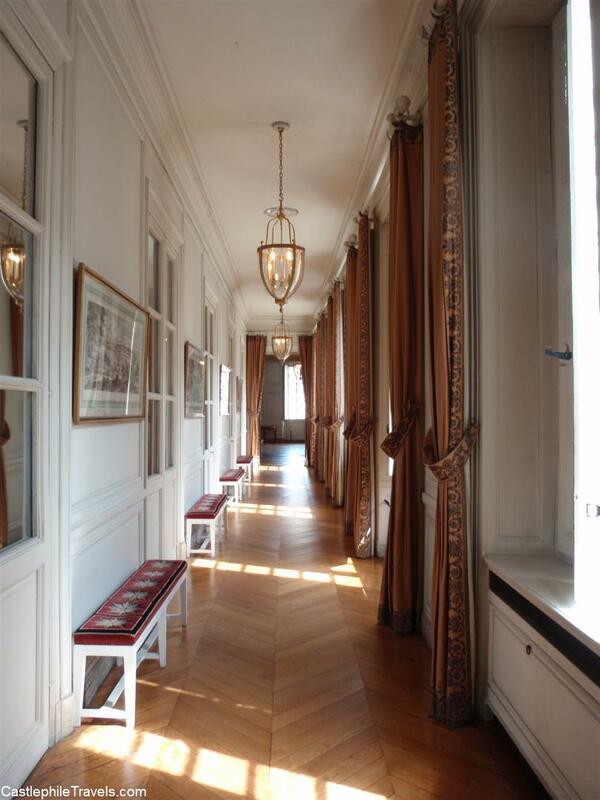 I think that the reason that I struggled to like the Grand Trianon during my last visit was a combination of the rooms being dark, there being no real information about the rooms or their historical significance, and the fact that as the last place you visit during your time at Versailles, you are genuinely tired. The Cotelle Gallery and the portico were still my favourite parts of the Grand Trianon (and you could walk through the Gallery – the last time I visited it was roped off). 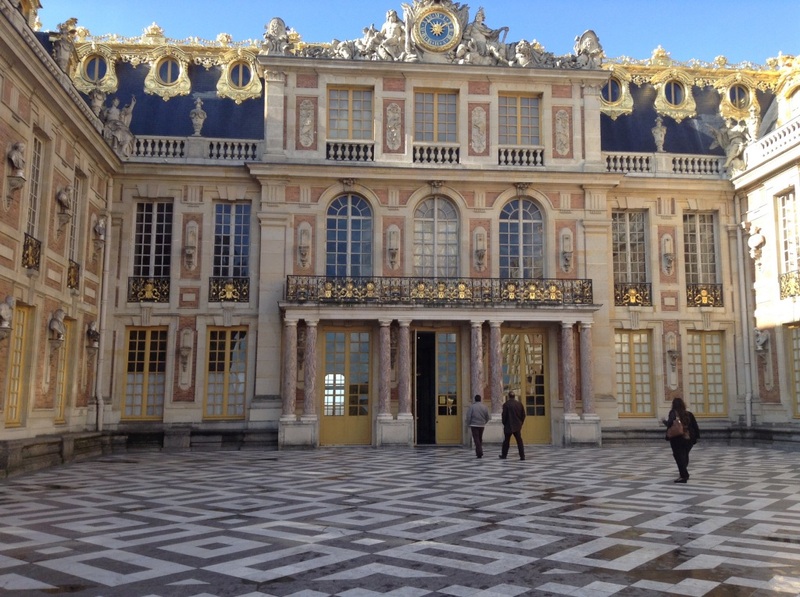 Overall, we were very lucky with the weather and had a near-perfect day to visit Versailles! I had no expectations about the Île de Ré. 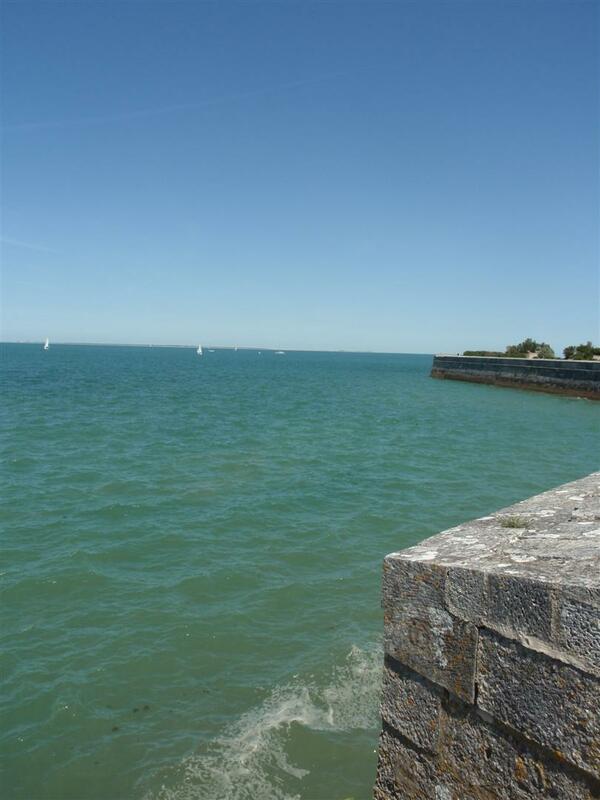 All I knew was that it was an island to the west of La Rochelle, and to bring my bathers because there would be a beach. As the bus drove across the causeway that links the island to mainland France, the scenery changed. Gone were the quaint villages, green fields and endless forests. 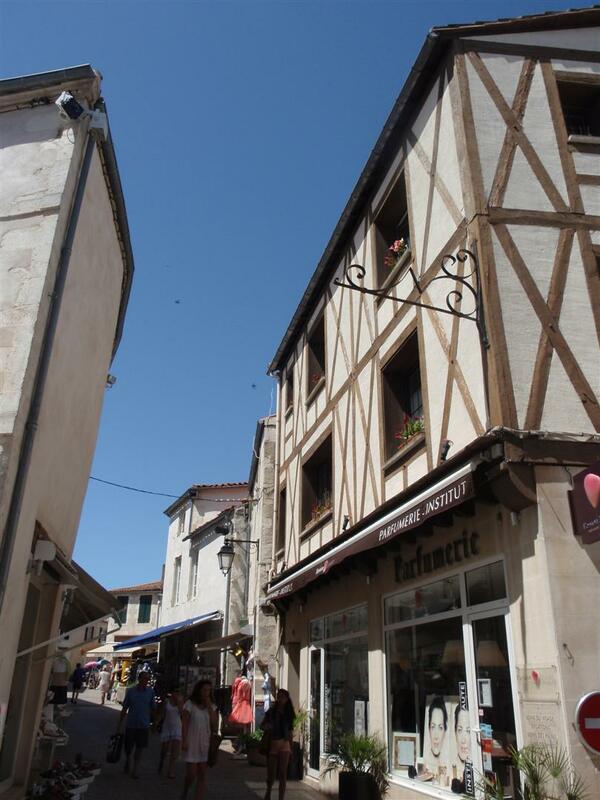 Now we were driving past campgrounds perched on the water’s edge, by salt marshes and through seaside towns as the bus made its way towards Saint-Martin-de-Ré. 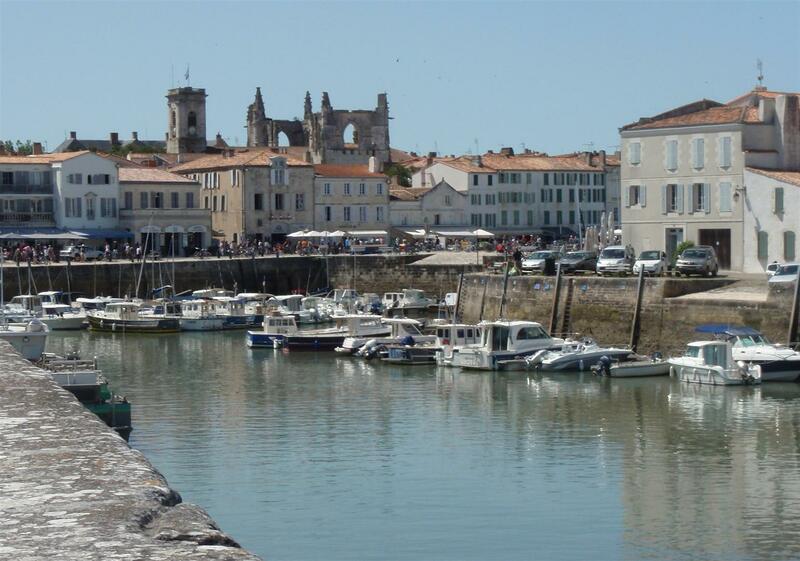 The French come to the Île de Ré for summer holidays, and there is everything from large camping grounds to fancy hotels to accommodate the holiday-makers. 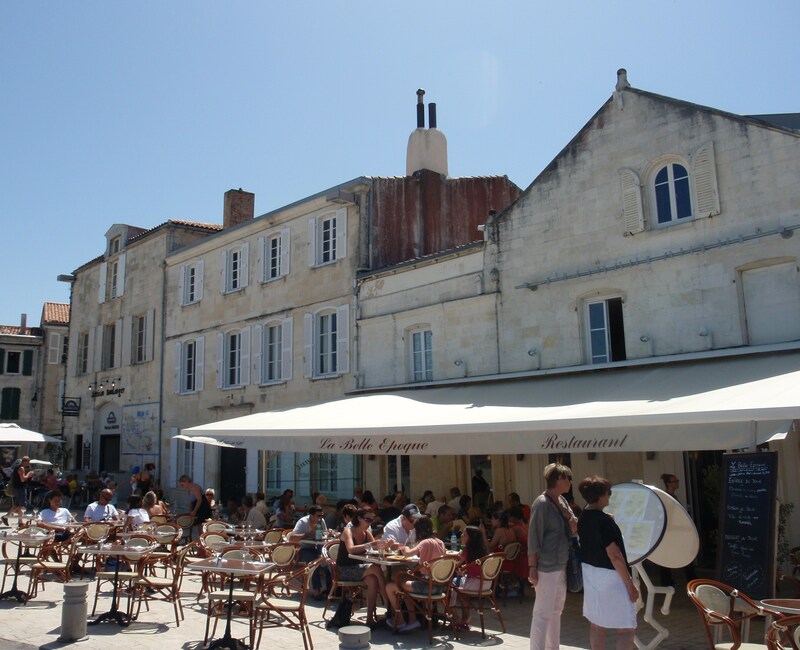 In Saint-Martin, restaurants are clustered together along the harbour, while behind them the laneways lined with souvenir stores, clothes shops and antique sellers lead up the hill to the ruins and bell tower of Église Saint-Martin de Saint-Martin-de-Ré. The Église Saint-Martin de Saint-Martin-de-Ré stands at the top of the hill and looks over the town. 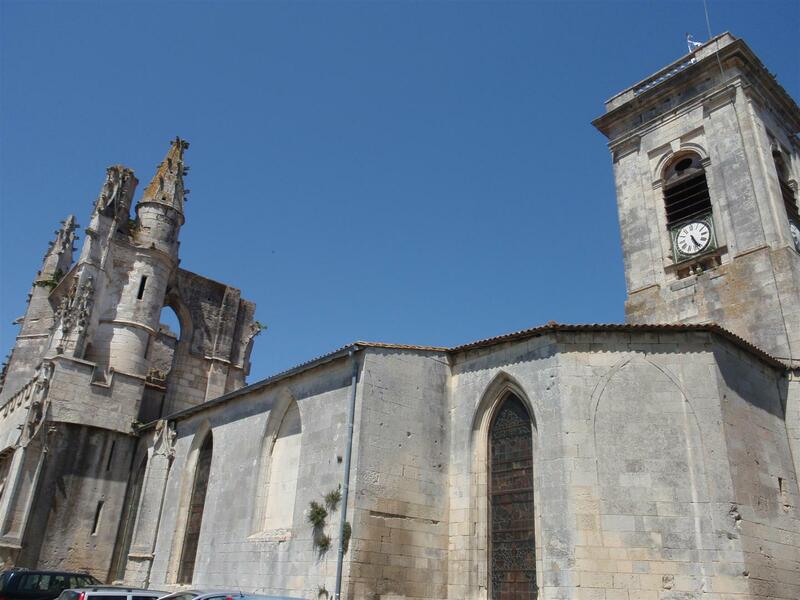 Visitors to the church can climb the belfry for a better look over the citadel and fortifications of Saint-Martin-de-Ré (part of the Fortifications of Vauban, a UNESCO World Heritage Site). 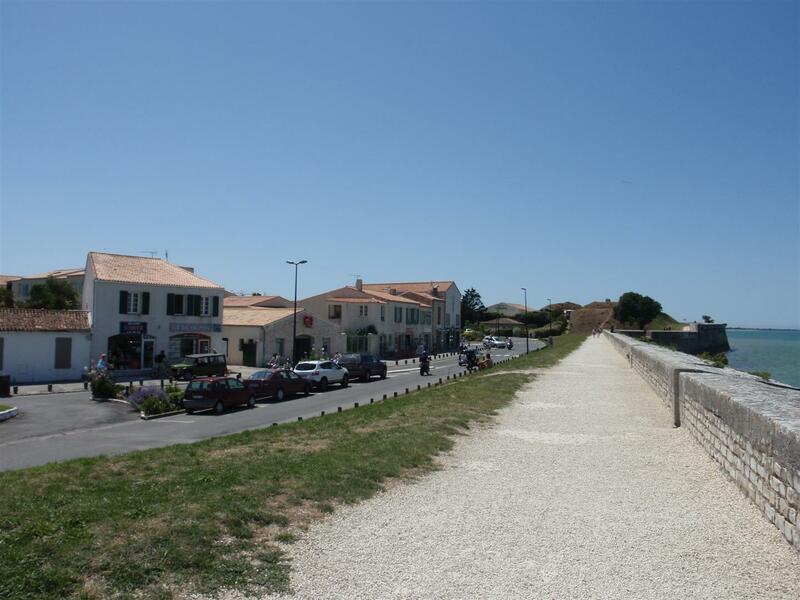 A stroll back down the hill through narrow laneways that shield you from the hot sun brings you back to the water’s edge, where you can walk along the fortifications of Saint-Martin-de-Ré, or make your way back to the harbour. The narrow laneways shade you from the summer sun! 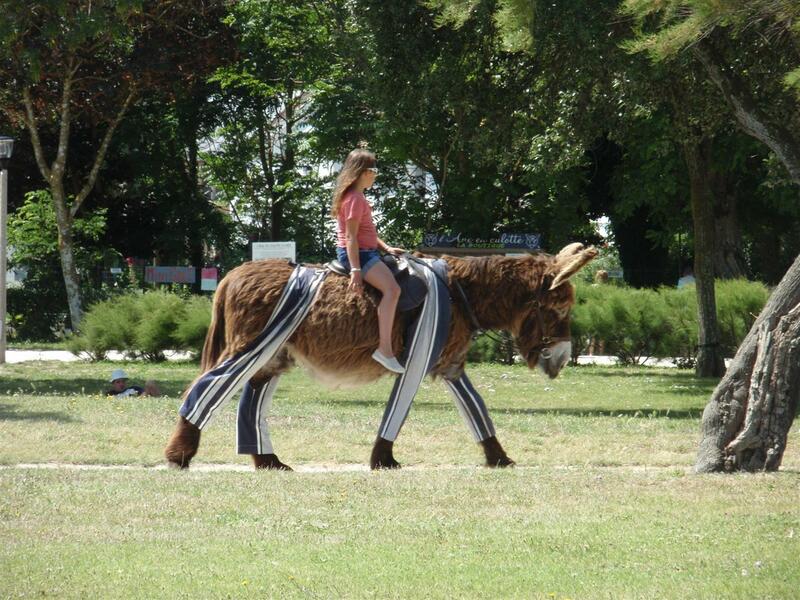 If you find yourself down in the Parc de la Barbette, you might come across a sight unique to the Île de Ré: donkeys who look like they’re wearing striped pyjama bottoms. While now a tourist attraction, the donkeys were originally dressed in trousers to help protect them from mosquito and other insect bites while they were put to work harvesting salt. 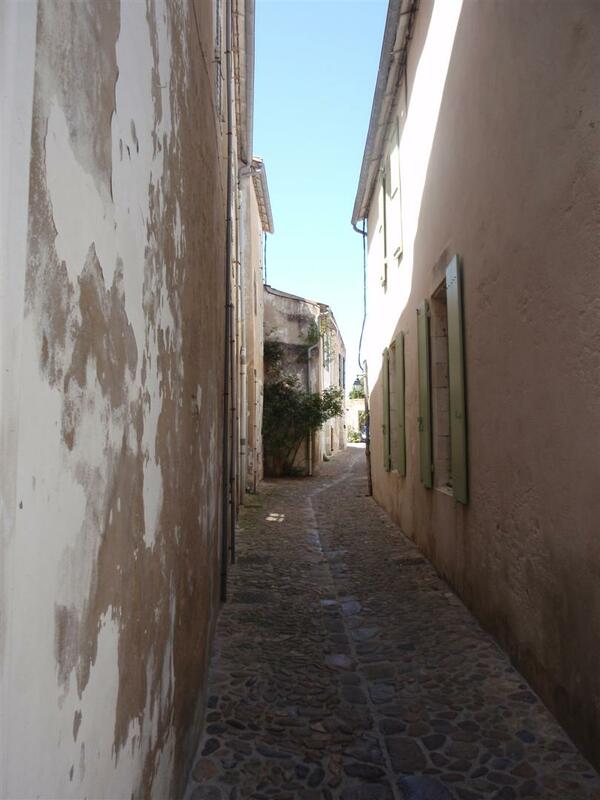 The laid-back atmosphere of Saint-Martin-de-Ré lets you unwind and have a holiday away from your hurried sightseeing of your mainland ventures. Breathe in the salty air, find yourself a spot to gaze at the view and enjoy letting go. The bus to the Île de Ré leaves from the Place de Verdun in La Rochelle. The bus schedule is posted at the bus stop. Tickets can be purchased from the driver. 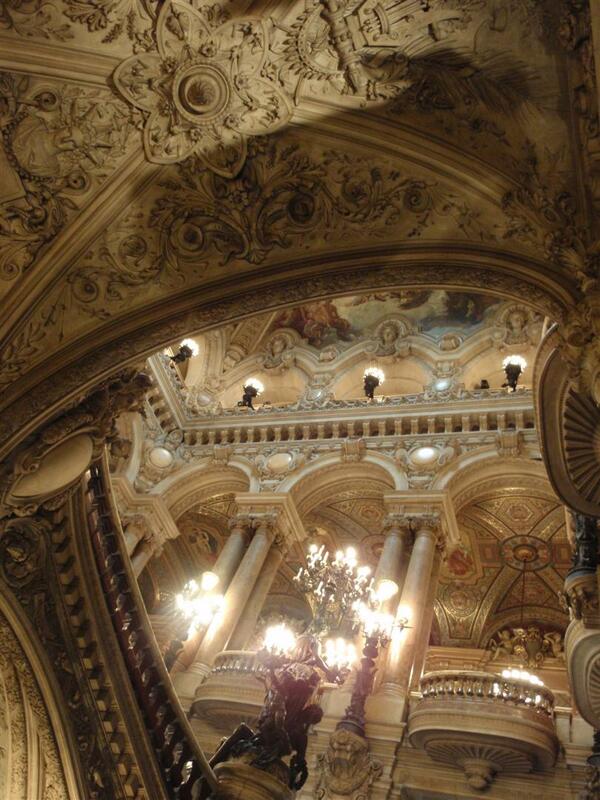 The Palais Garnier – home to the Opera Nationale de Paris – may well be one of the most lavish places I have set foot in. Designed by Charles Garnier (who also designed the Casino de Monte Carlo), it is spread over seventeen storeys and contains two ballet companies. 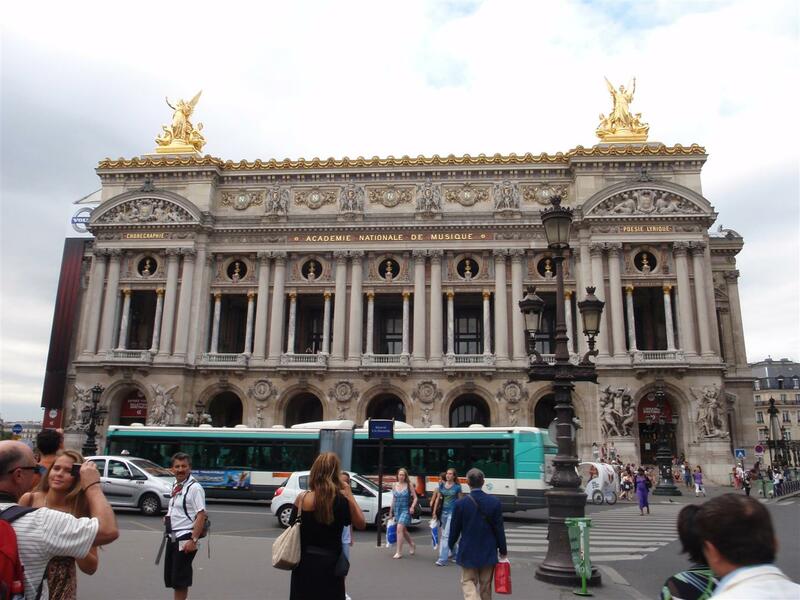 Having read Gaston Leroux’s book The Phantom of the Opera, and being a fan of Andrew Lloyd Webber’s musical, I was curious to know what the real Paris Opera was like. 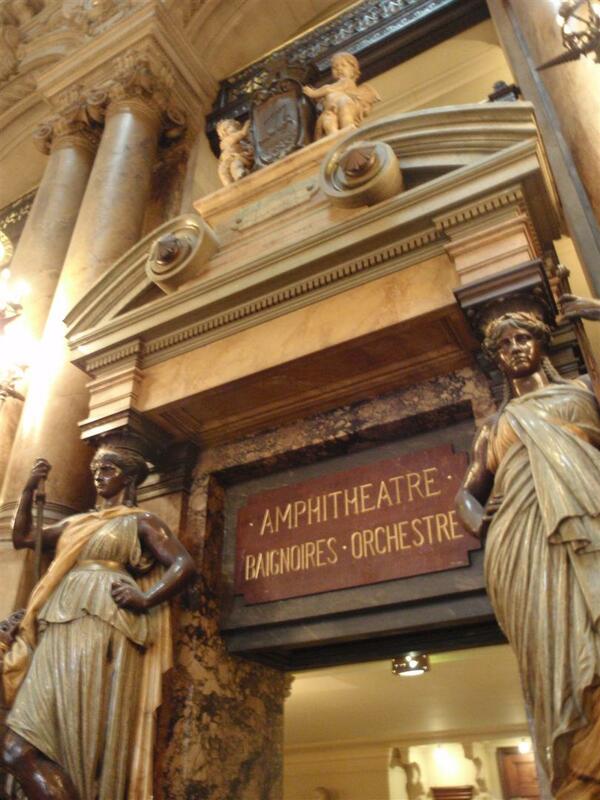 I booked a guided tour of the Palais Garnier, and was on the lookout for signs of the opera house’s most infamous resident. Guided tours begin in the la rotonde des abonnés. While you are sitting on the circular red velvet chaise, you can imagine men dressed in their finest suits and hats and ladies glancing at their reflections in the mirrors that line the room. On the ceiling, the intermingled letters spell out the name of the architect: CHARLES GARNIER and the dates of construction: 1861 – 1875. The rotunda is impressive by itself, but it is nothing compared with the rooms to come. The Grand Staircase is almost overwhelming. You have to stand still for a few minutes to take it all in. As you ascend the stairs, it’s hard to know where to look – at the statues and busts that line the doorways, the decorative marble and lamp fittings, or at the painting on the ceiling? Take the time to appreciate the full splendour of the Grand Staircase. 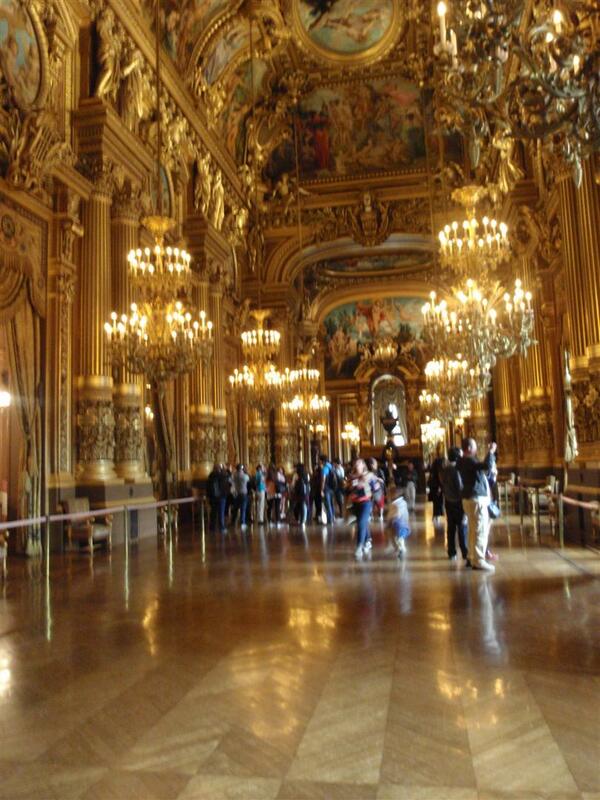 Walking along the Grand Foyer, you feel like you are in a grander version of the Hall of Mirrors at the Chateau de Versailles rather than in an opera house in the middle of the city. They have similar designs – a long room along the side of the building with mirrors along one wall and large windows on the other. 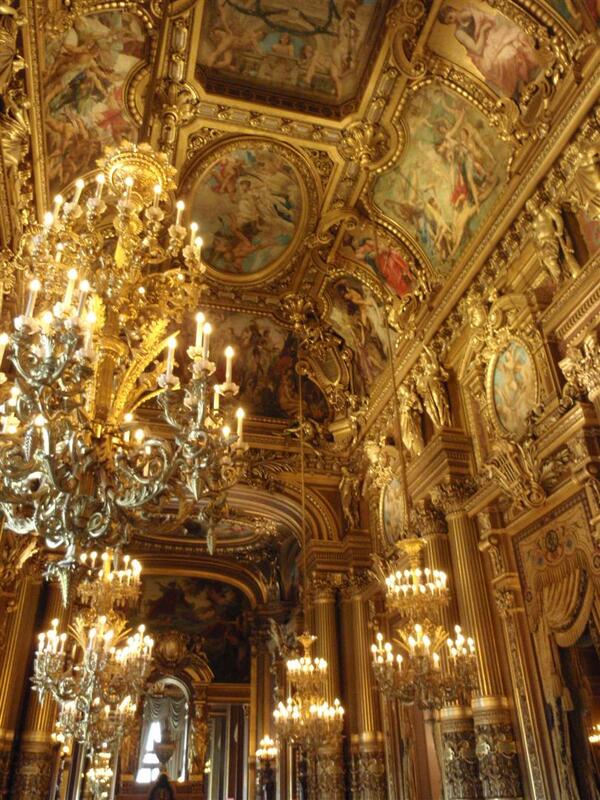 The Grand Foyer is decorated in musical motifs and along with the Grand Staircase is one of the most sumptuous rooms open to the public in the Palais Garnier. After the splendour of the grand staircase and the grand foyer, passing through the corridor that separates them from the auditorium seems anti-climactic. Dark and plain, it provides a welcome rest for your eyes as you wait to be shown to your seat. Off to the side, you’ll find Napoleon III’s entrance, which was especially designed for him to limit the risk of assassination. The Emperor’s carriage could be driven up into the Palais. From here, Napoleon III would be mere steps away from the Royal box. The entrance is also plainer than the rest of the theatre – war broke out and Napoleon III was deposed before the entrance could be decorated. 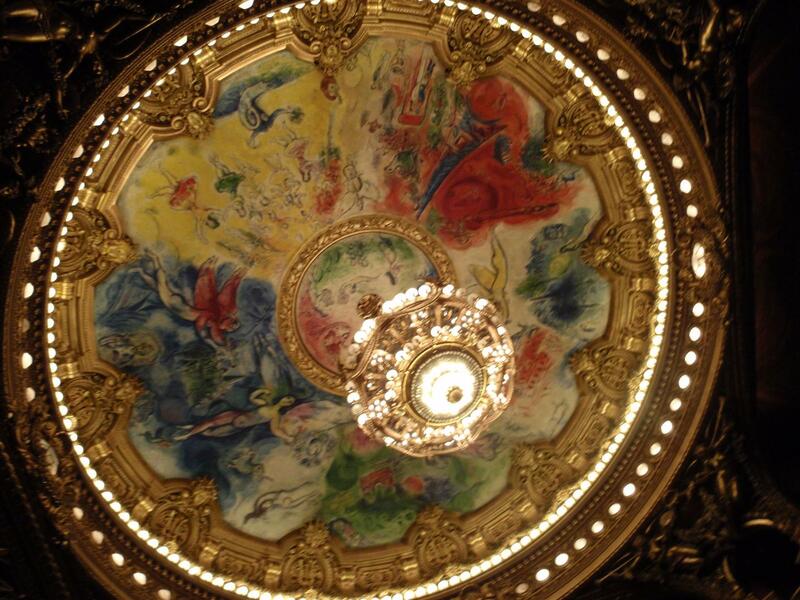 Once you have taken your seat inside the auditorium, your eyes start to wander again from the rows and boxes of red velvet seats, up to the ceiling with the glittering chandelier and Chagall’s painted ceiling insert depicting twelve famous operas. And as for the Phantom? 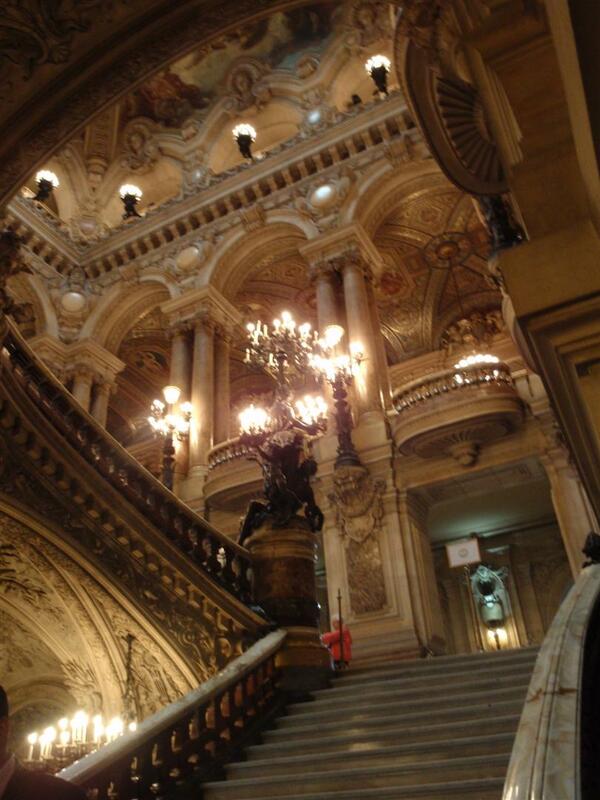 While the tour of the Palais Garnier doesn’t take you backstage, or to the fabled underground lake below the building, the Palais Garnier does pay their respects to the legacy and legend of the Phantom of the Opera. 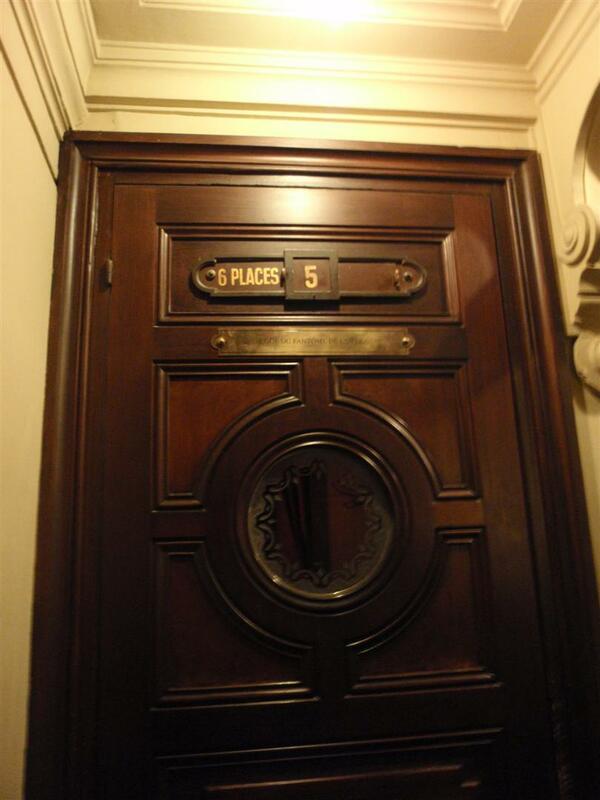 The Phantom’s standing request for Box Number 5 is noted with a plaque, marking it as the Loge du Fantôme de l’Opéra. Are you brave enough to book it? I’d be careful if I were you. You never know where the Phantom may lurking! The Phantom of the Opera is there … ?! 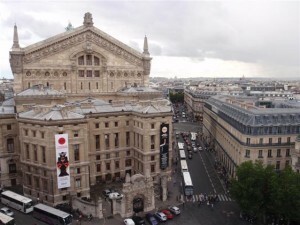 The Opéra station is right in front of the Palais Garnier. 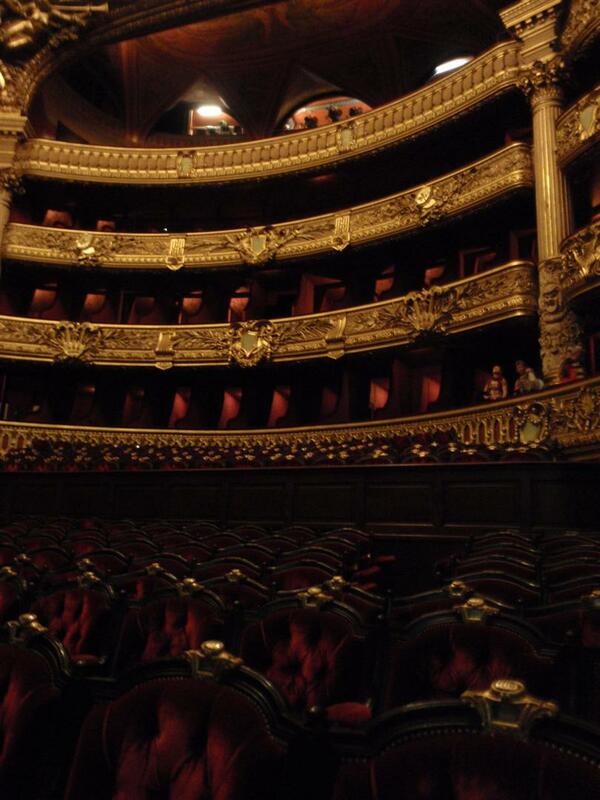 Would you go and see: Andrew Lloyd Webber’s musical The Phantom of the Opera if it was being staged in the Palais Garnier? It hasn’t been done, but I like the idea of watching it in the very theatre where the story is set. 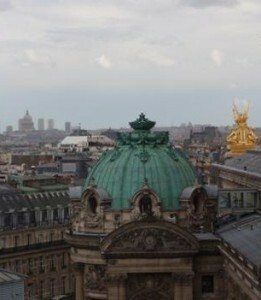 Did you know that you can look over the rooftops of Paris from the top floor viewing deck of the Galeries Lafayette? 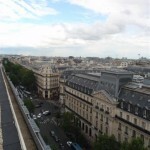 From here, you can look down over the busy Boulevard Haussmann and the back of the Opera Garnier, across to La Défense in the distance, or at the domes of the Grand Palais and Les Invalides flanking the Eiffel Tower. Take the escalator up to the top floor and walk out on to the terrace. 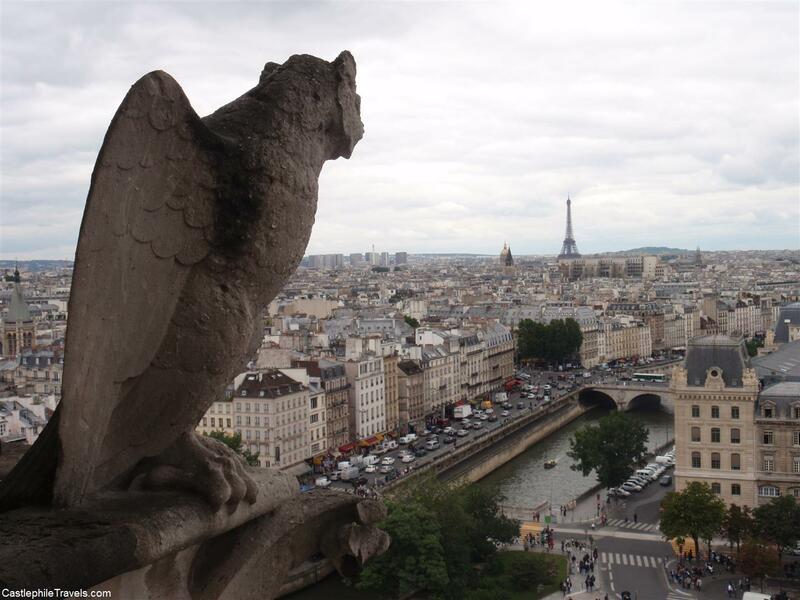 Do you have a favourite view over Paris? Share it in the comments! It’s a long walk from Versailles to the Grand Trianon. 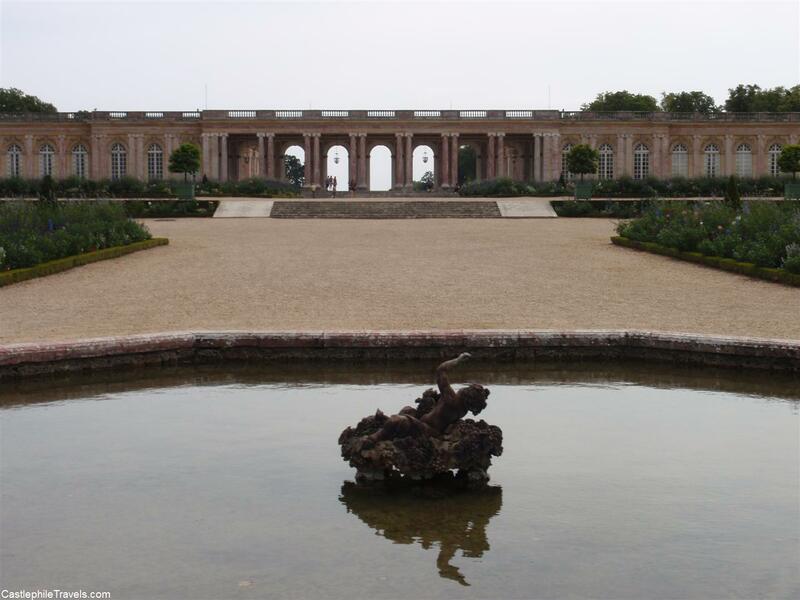 Tucked away at the back corner of the grounds of Versailles, at the end of the Grand Canal, the Grand Trianon is a single-storey palace that looks on to a colourful French garden. Originally built in 1687 by Jules Hardoiun Mansart for King Louis XIV on the site of an older palace and restored at various times by both Napoleon Bonaparte and Charles de Gaulle, it has housed many royal family members and foreign dignitaries. 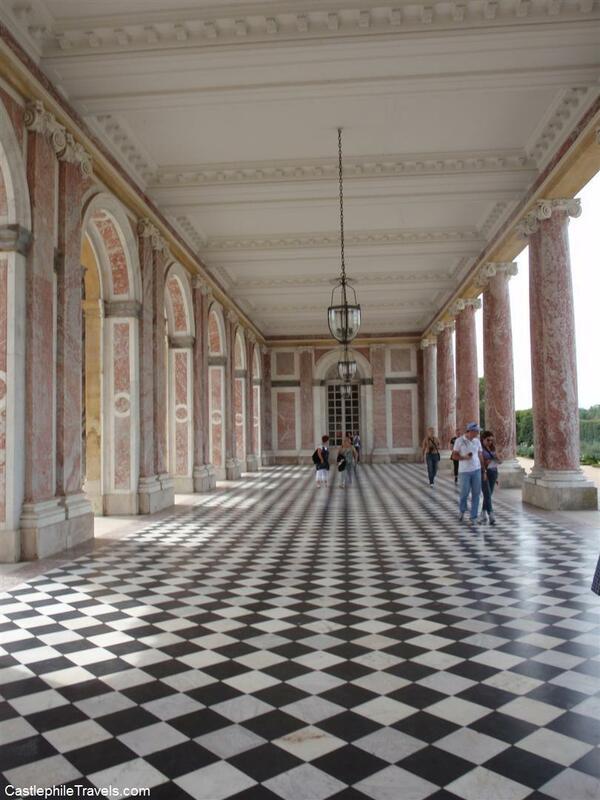 The portico of the Grand Trianon. The black and white tiles are beautiful. After I had been awed by the grandeur of Versailles, and fallen in love with the cosy Petit Trianon, the Grand Trianon had its work cut out in order to win me over. And it certainly tried its hardest. 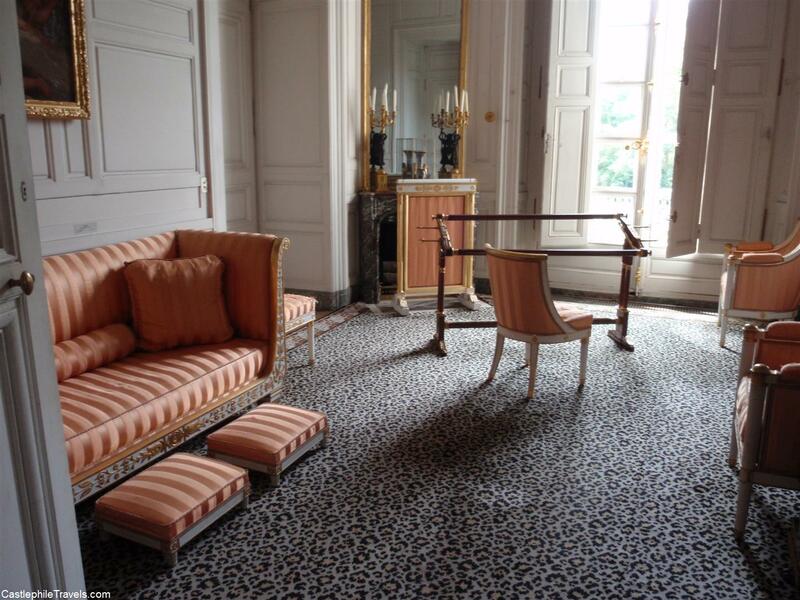 The Boudoir of Madame Mère, mother of Napoleon. Is that leopard print carpet?! The Cotelle Gallery – this would make a stunning ballroom! 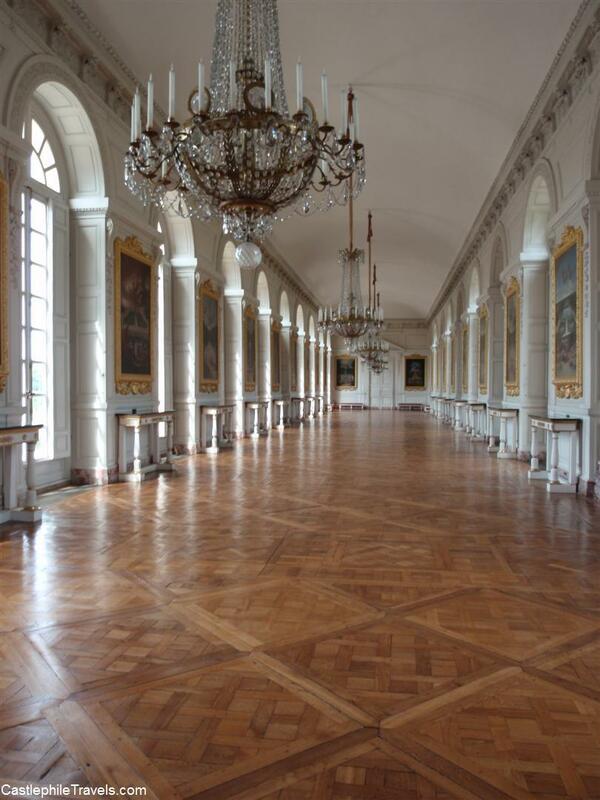 So did the Grand Trianon win me over? Not quite. While I loved the symmetry of the black and white tiles against the red marble colonnaded portico, and the elegant windows and massive chandeliers of the Cotelle Gallery, I felt as if the Grand Trianon was missing something. Perhaps it was because I couldn’t associate it with anything. 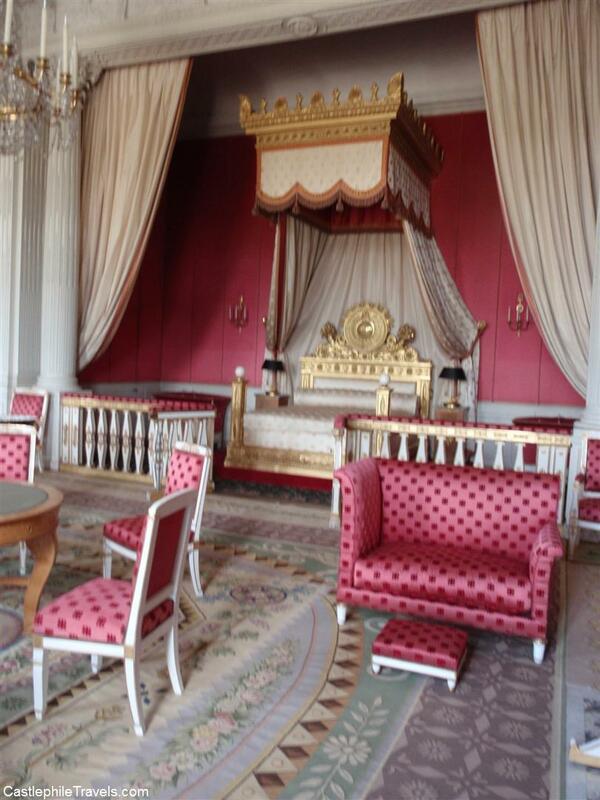 While I could link Versailles to Louis XIV, the Sun King, and the Petit Trianon to the whimsy of Marie Antoinette, I couldn’t connect the Grand Trianon to a historical person or event. It wasn’t as awe-inspiring as Versailles, and it didn’t have the cosy feeling of ‘I could live here’ that I felt at the Petit Trianon. It also came at the end of a long day of exploring the estate – maybe it was just bad timing that I didn’t appreciate the Grand Trianon as much as I did the rest of Versailles. 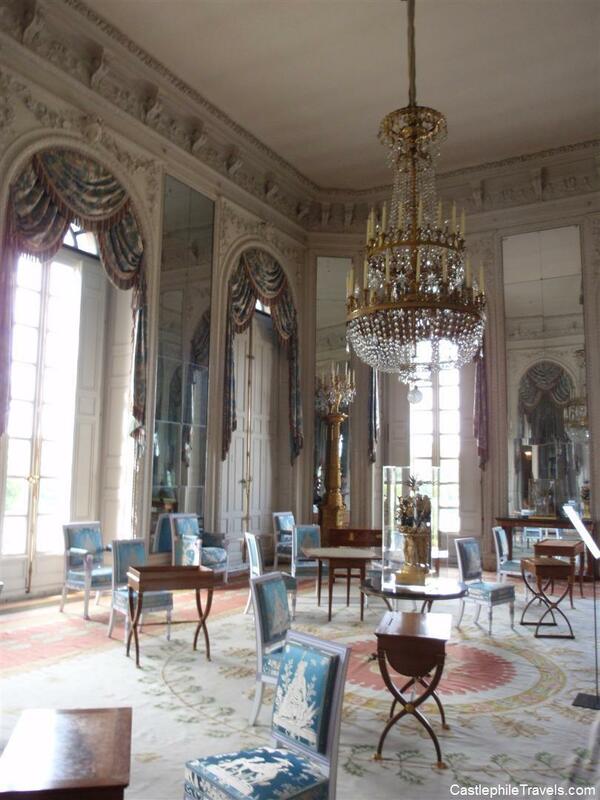 Have you been to the Chateaux de Trianon? Which did you prefer? Share your opinion in the comments! As my train pulled in to the Gare d’Austerlitz station and I set foot in Paris for the first time, I had one thought in my mind: When would I get to see the Eiffel Tower? 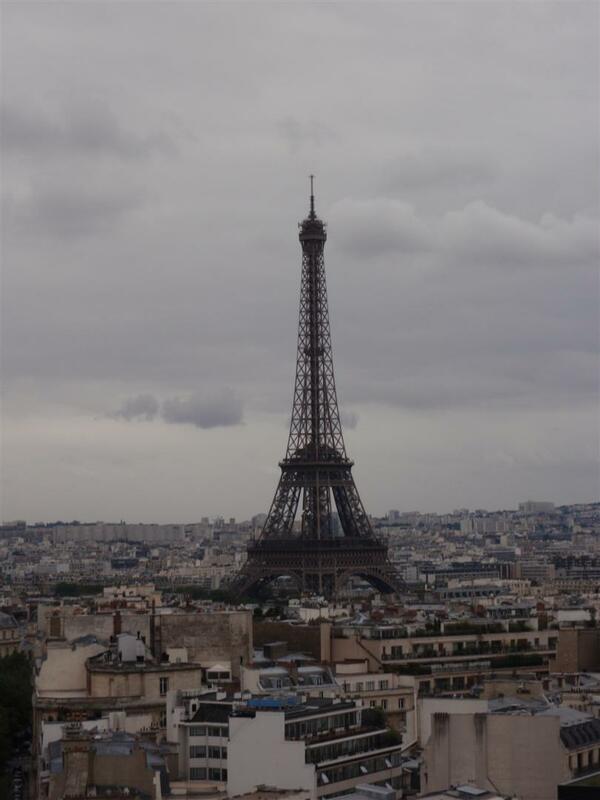 I couldn’t go to Paris and miss out on seeing the Eiffel Tower, the city’s begrudgingly adopted icon. While wandering around Montparnasse, I found myself heading towards the golden dome of Les Invalides. I happened to look to my left and there it was, peeking out from behind a row of trees: 312m of iron. I just wanted to spend all afternoon staring at it. 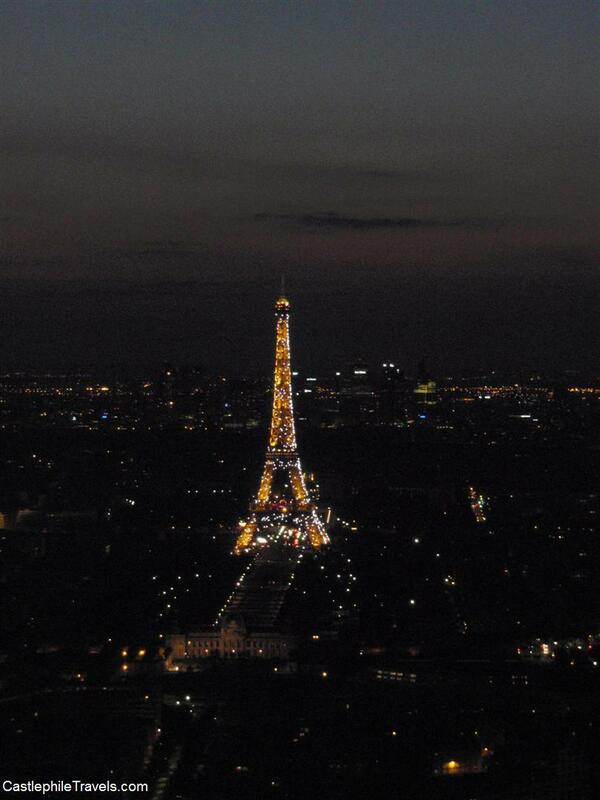 How lucky I was to be in Paris, right next to the Eiffel Tower? As I tore myself away from the view and began exploring Paris, I realised that I shouldn’t have worried about missing out on seeing the Eiffel Tower. 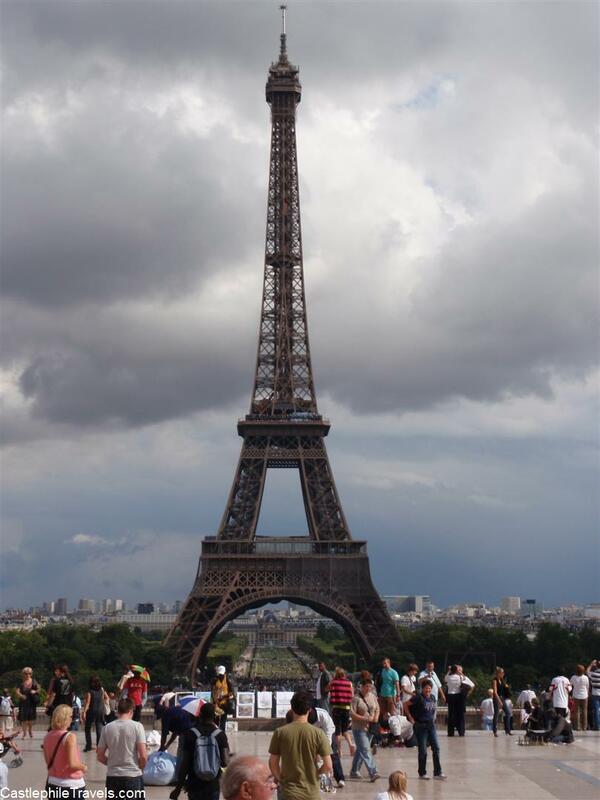 As it’s one of the tallest buildings in Paris, it can be seen from almost anywhere. 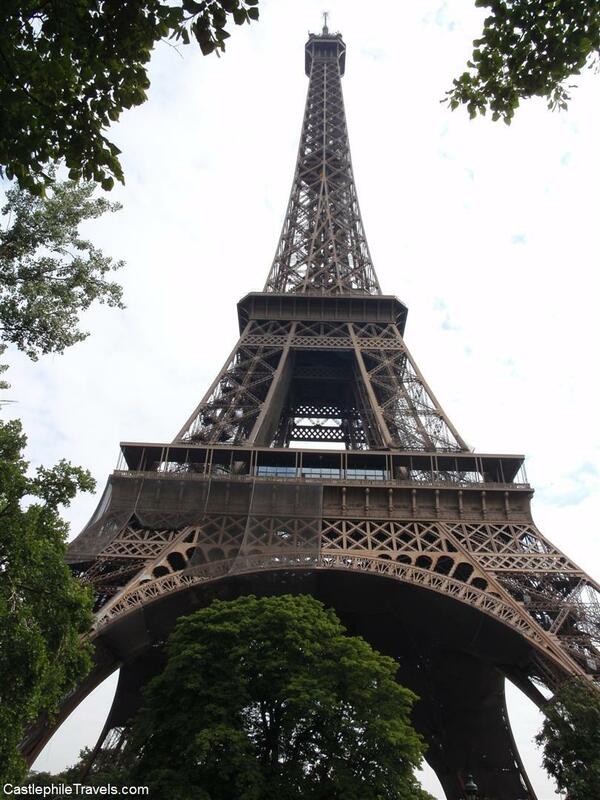 If you can see the Eiffel Tower from almost anywhere, where should you go? 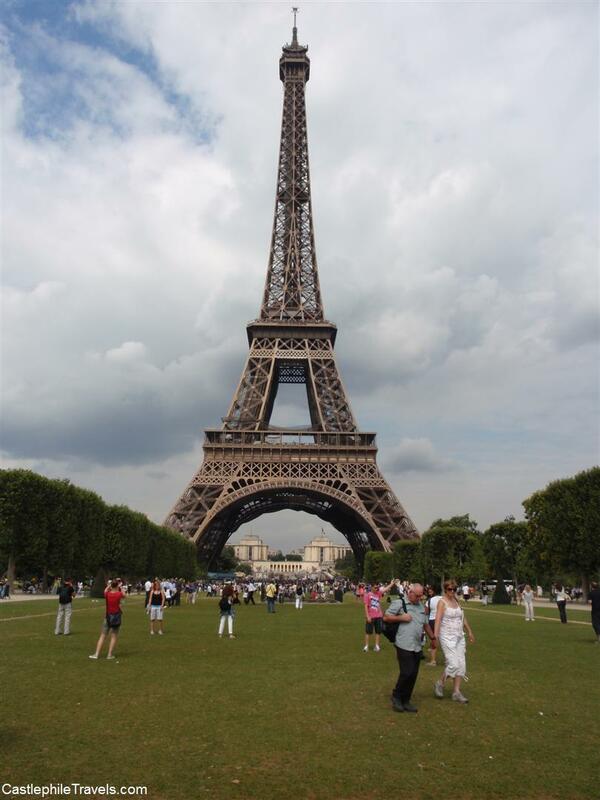 To fully appreciate the Eiffel Tower, it’s best to visit it at ground-level. Look up at the 10100 metric tons of iron above your head, and think about how many components (2.5 million rivets and 18000 metal parts!) the tower is made up of. Gawk at the omnipresent lines of people (be on the lookout for scammers! 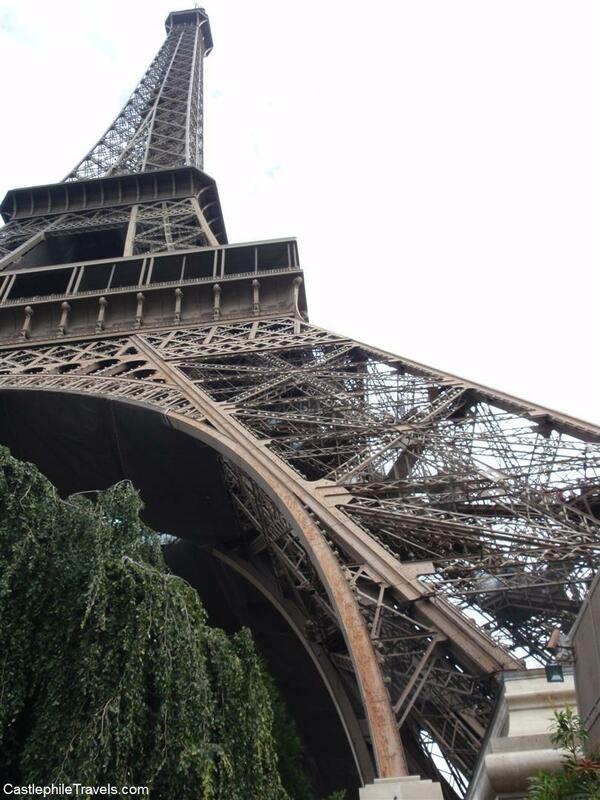 ), and while you’re here, why not climb up the Eiffel Tower? The Parc du Champs de Mars is a area of lawn that stretches out between the Eiffel Tower and the École Militaire. It is a popular place for tourists to bring some baguettes and cheese and have a picnic with a backdrop of one of Paris’s most iconic views. Across the Seine from the Eiffel Tower is the Trocadéro. You’ll find plenty of coaches dropping their tour groups off here for photo opps, but don’t be deterred (after all, it is one of the best places for photographs!). Whether you’re floating down the Seine on a boat cruise or crossing one of the famous bridges of Paris, you can’t miss the hazy view of the Eiffel Tower. While you’re whispering in the ears of the chimeras as they stare wistfully out towards the Eiffel Tower, ask them what they were staring at before the tower was constructed! 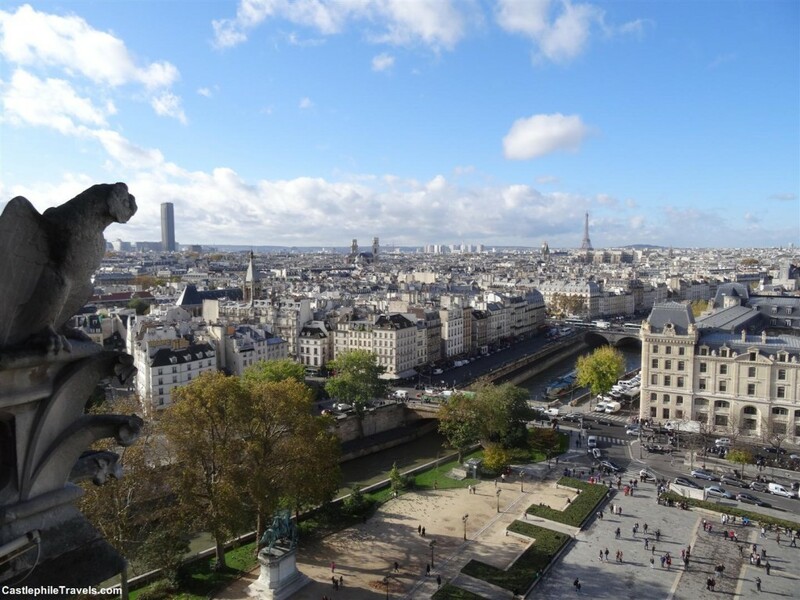 The view from the towers of Notre-Dame de Paris will give you a sense of just how much taller the Eiffel Tower is than the rest of the cityscape. One of the closer vantage points to the Eiffel Tower, if it’s busy at the top of the Arc de Triomphe, you’ll have to wait (or push your way to the front) to get the perfect view of the Eiffel Tower nestled amongst apartment buildings. 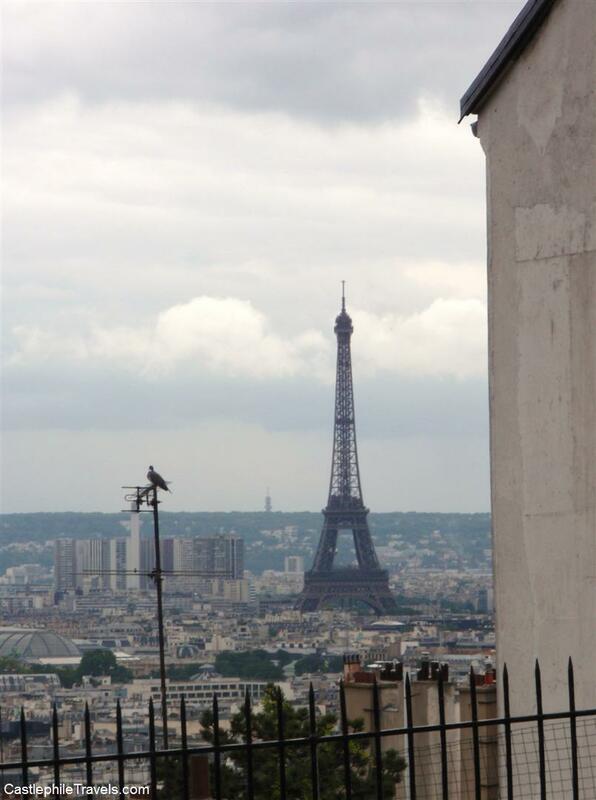 Looking out from the top of the Montmartre, you can catch a glimpse of the Eiffel Tower. While it’s too far off to the right to be seen while standing in front of the Sacré-Cœur, the Eiffel Tower reveals itself just as you turn from the Parvis du Sacré-Cœur on to the Rue du Cardinal Guibert. My favourite view of the Eiffel Tower is from the top of Montparnasse Tower, where you have an unobstructed view of the city skyline and, if you’re there at the right time, the sparkling tower. 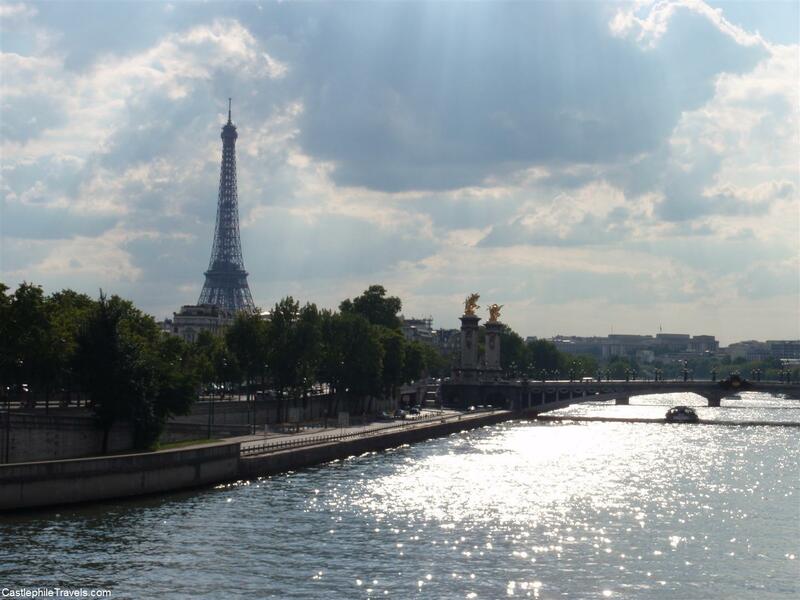 Where’s your favourite place in Paris to gaze at the Eiffel Tower? Share it in the comments!